If you haven't been cleaning your cat's ears on a regular basis, you're taking a chance with his health. A build up of waxy debris can create the perfect environment for mite infestations, as well as bacterial and fungal infections. Cleaning a cat's ears isn't always easy, but like regular dental care, it's a job that has to be done. Most cats dislike having their ears touched, so cleaning them can be a challenge. Try following the steps outlined here, but keep in mind that you can always have your vet clean your pet's ears if it's too difficult to manage on your own. Set up your ear cleaning supplies so they're close by when you need them. Wait until your cat is in a relaxed mood, and hold him in your lap with his rear facing toward you. That way he'll back into your body if he tries to get away, and you'll have more control. Gently fold back the flap of one ear to expose the opening of the canal. Add several drops of the ear cleaning solution to your pet's ear, and massage the base of the ear for 15 to 20 seconds to help the solution get down into the canal. Wet a cotton ball with a little more of the cleaning solution, and gently wipe out your cat's ear. If the cotton ball is very dirty, repeat this step with a fresh cotton ball to make sure you've removed as much wax and debris as you can. Wipe the inside of the ear clean with a dry cotton ball, and add a little of the ear grooming powder to the ear canal to help remove excess moisture. Repeat the entire procedure on the other ear, beginning with a fresh cotton ball. Reusing a dirty cotton ball from the other ear can transfer mites, bacteria or fungus from one ear to the other. Although the cat in this video appears to be much calmer and cooperative about having his ears cleaned than the average feline, it still helps to watch exactly how the cleaning is done. It's not completely necessary to follow up the cleaning by putting powder in the ear, but it's an extra step that can help keep your pet's ears in better condition between cleanings. Some people recommend using hydrogen peroxide to clean a cat's ears, but peroxide can be very drying. It's usually better to use an ear-cleaning product specifically designed for cats. This product is produced by Doctors Foster and Smith. Ear Clens Solution is designed to help dissolve wax and remove debris without overly drying the ear. It adjusts the pH inside the canal to prevent fungus and bacteria from growing. Foster and Smith also offers a three-piece kit that includes the solution, ear wipes and powder. Vet Solutions is another ear cleaner that's safe to use on cats. It cleans, dries and acidifies the canal to keep microbes from growing. The formula includes aloe vera to protect the ear from becoming too dry, which could cause additional irritation. This cleaner from 1-800-PetMeds is advertised as gentle enough to use every day, if needed. The solution acts as an antiseptic/antimicrobial, and it also contains soothing aloe vera gel. Checking your cat's ears on a weekly basis and cleaning them as needed could help you spot a problem before it has a chance to grow into something more serious. If you notice a foul odor, see blackish discharge or green pus coming from your pet's ear canal, schedule an exam with your vet right away. 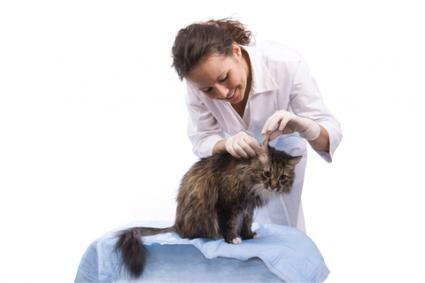 The vet may need to perform a deep cleaning to remove as much of the material as possible before medicating your cat's ears. After your pet's ears have been treated, it will be up to you to continue taking care of them.